The coaching philosophy of new UW-Milwaukee women's basketball coach Kyle Rechlicz can be summed up in one word. Well, maybe not the entire philosophy, but it's not a bad place to start. Like, for instance, when the moment of truth arrived and she made the decision to leave her position as an assistant coach at her alma mater, the University of Wisconsin, and take the head coaching job at UWM. "Truthfully, it was my husband and my daughter and I sitting at home on our couch and we had a little bit of a pow-wow and we talked about fit," she said. "And I wholeheartedly believe this is the right place for me. "I feel that I am a fit for UWM and UWM is a fit for me." Fit is indeed the magic word where Rechlicz is concerned. "I love it," she said. "And that's how I'm going to recruit. Players have to fit. It's not always about the best players or the most talented players. It's about a fit (for the program) and making sure they work within that and are fitting within our program." Rechlicz takes over for Sandy Botham, a three-time Horizon League coach of the year who coached the Panthers for 16 years, compiled records of 245-225 overall and 156-102 in the Horizon League, and is the Horizon record-holder for most career league victories for a women's basketball coach. "Her incredible tenure here at UWM is something that I strive to live up to," said Rechlicz. Rechlicz spent last season as an assistant coach and recruiting coordinator for the Badgers. As Kyle Black, she was a key member of the Wisconsin women's teams from 1998-2002. After her playing days, she was assistant coach and recruiting coordinator at Cleveland State (2003-'07) and then associate head coach and recruiting coordinator at Dayton (2007-'11). Rechlicz said her preference was to play an up-tempo style, a message she already has relayed to the returning players. "I'm very much of a transition-style coach. . . pick up the pace," she said. "Defensively, we're going to pick it up as well. 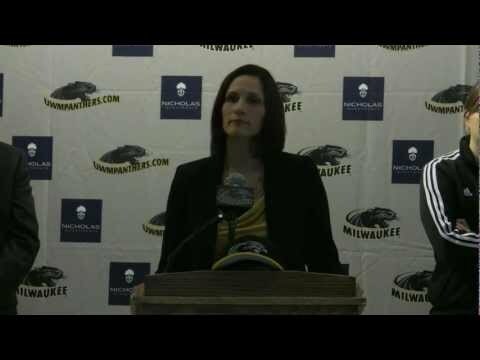 I want some excitement on the court so people will want to come to the games and really be excited for UWM basketball." Rechlicz takes over a very young team that went 5-13 in the Horizon last season and 9-21 overall. She is familiar with the returning players since Wisconsin played UWM last season and also because she has watched much film of them. "They developed over the course of the year and I think that we have a lot of talent," said Rechlicz. "I think they need some direction and I think we're going to bring out the hardest-working aspects of their game. "They're going to be challenged a little bit more and I think you're going to see their skill level rise throughout the season. " Rechlicz said her top three priorities would be getting connected with the players on an individual level along with their families, making sure the incoming freshmen realize they are a very important part of the program, and - first on the list - hiring a staff. "I know in this coaching profession you can't do it alone," she said. There were many factors involved in Rechlicz's decision to take over the Panthers, not the least of which was severing her ties with Wisconsin. "There are a ton of factors involved," she said. . .
"But my heart is now here at UWM and I can't wait to start working with this team and start meeting people here in the athletic department and getting out in the community. "This is a dream come true. So exciting."